April 20, 2017 / Modified apr 20, 2017 6:56 a.m. Donated tampons and sanitary pads. On average women spend almost $3,000 on feminine hygiene products throughout their lifetimes. A Tucson organization is finding ways to help women in need get these items. "Project Period" collects tampons and pads for such women. Run by the YWCA of Southern Arizona, the program distributes the donations to various organizations, such as Teen Outreach Pregnancy Services. The work helps young mothers financially, said program director Laura Pedersen. “The adolescent population that we are working with, they just don’t look at their own needs. 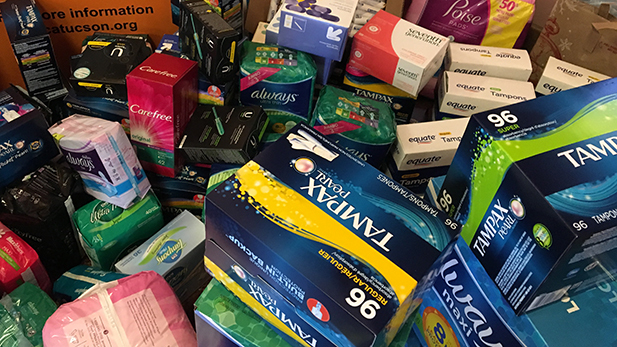 Typically, they’re looking at the needs of their child.” Pedersen said these items are important for the health of the women the project serves. Pedersen said people can help by buying an extra package of pads or tampons. Those donations can be dropped off at the YWCA Community Center.